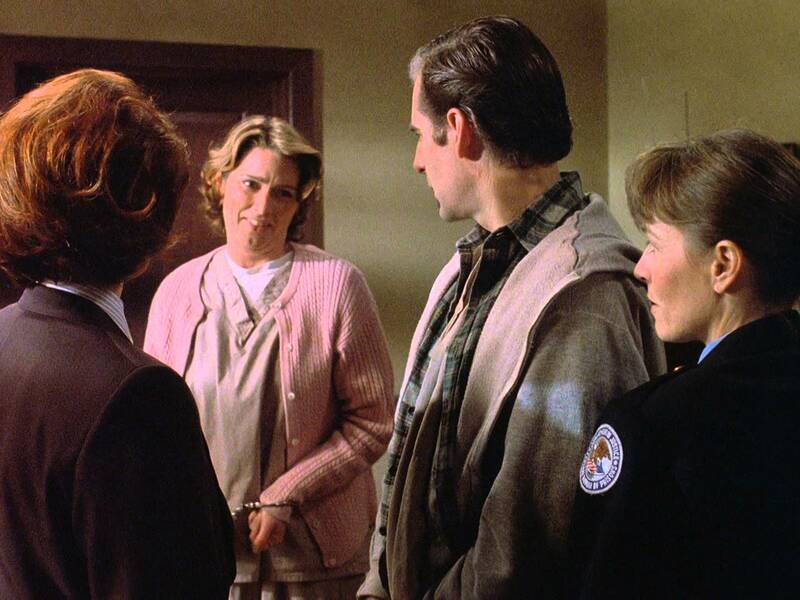 Sam (Scott Bakula) and Alia (Renee Coleman) find themselves in the forms of two women held in a prison in Revenge of the Evil Leaper, or Evil Leaper III. This final installment of the Evil Leaper Trilogy aired on 23 February, 1993, and marks the last time in the series that Sam leaps ito a woman. Written by Deborah Pratt the story wraps up the Evil Leaper arc in an emotional way, as Alia’s observer, Zoey (Carolyn Seymour) is leaped in by her project supercomputer, Lothos, and takes the form of the prison warden. The time-travelling pair are in prison on 16 September, 1987, and Zoey, aided by a new observer, Thames (Hilton Battle) are determined to make sure Sam and Alia never leap again. As prisoners, they are both accused of murder, and the guards attempt to turn them against one another, in effect damning one at the expense of the other. Al (Dean Stockwell) helps Sam hide Alia’s brainwaves, recalling how in the episode Shock Theater Sam’s waves were scrambled. This episode pays off for long time viewers, tying the threads of stories together and it definitely packs an emotional punch. With Zoey there messing with history for her project’s dark reasons, both Sam and Alia’s lives are hanging in the balance. When Zoey is revealed to Sam the prison hell becomes a prison break as the two time-travellers try to escape Zoey and the army of guards at her disposal. But when Alia makes a selfless sacrifice she leaps to somewhere she is free and when Sam reveals the real murderer he leaps. Seeing the way Thames is dressed, you have to wonder from what time Alia and her project came from. Are they from a paralell univere? Alternate timeline? Goodbye Norma Jean was written by Richard C. Okie and aired on 2 March, 1993. Sam finds himself on 4 April, 1960 and he is confronting a screen icon, it seems he’s leaped into the form of Dennis, the personal driver to one, Marilyn Monroe (Susan Griffiths). Al informs him that his job is to keep Marilyn alive and help her to make one last film in 1961. Sam is afraid they are close to the date of her suicide, so to make sure Marilyn has companionship, he hires a young woman, Barbara (Liz Vassey) to serve as her assistant. Al is envious of Sam in this episode, but both of them are determined to do their best to save her life. Sam gets to see how lonely and sad Marilyn is, and he wants nothing terrible to happen to her. But is Sam’s heroic do-gooder streak enough to save her life? And what is Barbara really up to? Barbara is exploiting Marilyn’s celebrity for her own gain, but Marilyn doesn’t believe Sam and fires him. Sam struggles to get Marilyn clean and sober, all while Barbara tries to steal her role out from under the screen legend. Despite the episode dealing with real people in a fictional recreation, it ends up beIng a very strongly written tale, and Griffiths makes for an enjoyable Marilyn.